I must admit that when I first heard of Tuner - DaTuner, I was skeptical. Whadaya means there’s an app that will help me tune my guitar just about as well as if I were using a normal tuning device? To my pleasant surprise, I was wrong to judge DaTuner so quickly, because it turns out that that it actually really delivers. Find out more details about the app’s functionality in today’s review. Tuner - DaTuner makes an excellent replacement if ever you happen to have forgotten your tuning device. This is a review of the app’s lite version; admittedly the full version comes with a lot more options, but the lite versions will do users who are looking to just tune their guitars perfectly fine. The first thing that struck me when I started up the app was the great yet simple interface, which consists of decibel (dB) and Hertz (Hz) views. The two views are set up like a coordination system between which the actual display can be found—i.e. which tone is being played, and which position it’s being played in. The display turns green as soon as you hit the right tone, becoming more and more red the further you stray from the tone. I should mention that DaTuner is a chromatic tuner, meaning it can recognise all 12 tones, and not just the ones on a guitar. Hurrah for all the harpists and kazoo players out there! Tuning isn’t all that complicated: you play a chord and check by how many Hz the chord is out of tune (check on the display, of course). The chord is tuned when 0 is displayed. 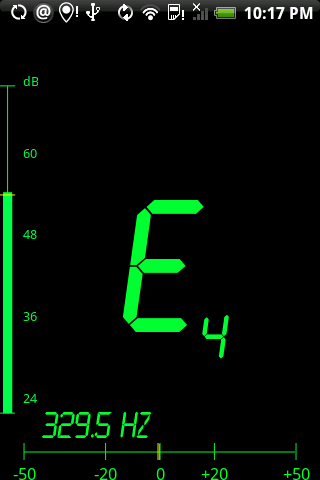 The frequency is also displayed. A few parametres can be readjusted to suit the user’s individual needs. Go to settings to change the sensitivity, the exactitude, the colours or the times. The lite version doesn’t come with as many features and functions as the paid version, such as ‘Transposition’ and ‘Notation’, as well as tons of settings and options. 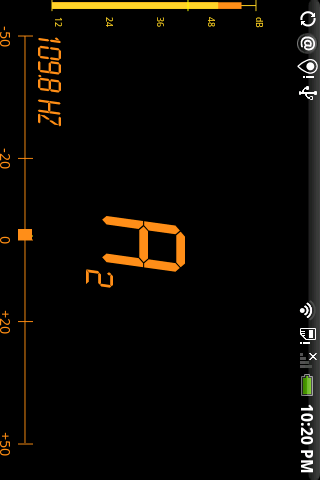 You can also switch ‘Auto Sensitivity’ on or off by hitting the volume display. When it’s switched on the display automatically adapts to the volume. I’ve been using DaTuner for a while and am totally satisfied with the results. That said, it’s worth experimenting how best to hold the smartphone’s microphone to the guitar, seeing as the results will vary quite a bit depending on how the mic is positioned. It might also be worth mentioning that there aren’t any ad banners in the lite version—cool! I can recommend Tuner - DaTuner to all musicians, particularly to guitarists. The results are surprisingly accurate and the app is a chromatic tuning device, meaning it can help tune unusual tones, too. This review is of the lite version, which I’m totally happy with. I will be buying the paid version very soon. The UI is a cinch to understand and to use. The same goes for Tuner - DaTuner’s controls, though I dare say that inexperienced users might have to practice using the app and their instrument at the same time. Tuner - DaTuner operates smoothly; I was pleased with the overall performance. No crashes throughout the testing phase. This is a review of the Tuner - DaTuner’s lite version, and I must say that the app has a lot to offer, especially considering that it can be downloaded for free. I can wholeheartedly recommend the full version too, especially for musicians or people who spend a lot of time playing their instrument(s). That said, the lite version is great, and free of ads to boot!